It would appear that my lazy summer Sunday turned into a lazy summer Monday, Tuesday, Wednesday, and Thursday! Actually, I started a neat project to share with you earlier this week, but two of the gluing steps took 16 hours each to dry. Unacceptable, right?! I must find a faster-drying glue! While the glue dried, I painted a first coat of paint on a whole bunch of small projects I've been hoarding saving. It felt so good to be working in my studio again after a lot of being busy with other things, and I should be back to posting these DIY projects soon. Meanwhile, I hope you're not tiring of Friday Finds, cuz I just love 'em! They give me a chance to curl up on my sofa with my laptop and visit my favorite blogs, then share what I love with you. One of my favorite blogs, MT-Tails, has had a name change to Oliver and Rust. Meg has put together a photo tour of her home that I know you'll love as much as I do. Angie has a new blog series at Postcards From the Ridge featuring her favorite paint colors and some tips for picking the right ones for our own homes. This one is Benjamin Moore's Manchester Tan, one of the colors I'm contemplating for my own master bedroom. 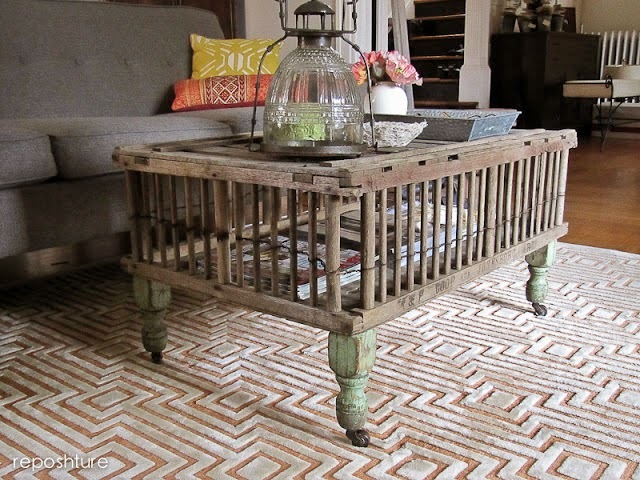 At Reposture Studio Kim added some fabulous legs to a chicken coop and made this awesome coffee table. I'm seriously in love with it! 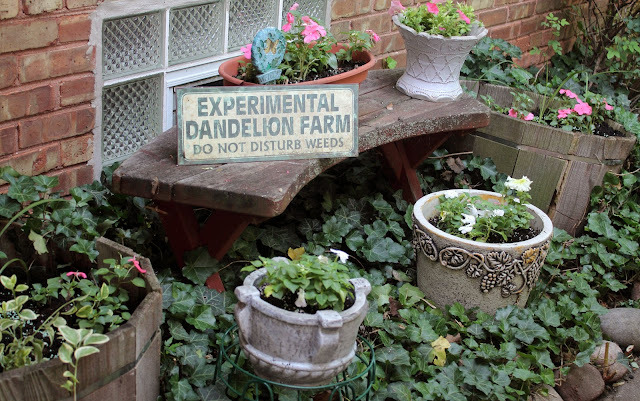 I'm also in love with this adorable funny garden sign found in Jane's garden over at Blondie's Journals. These sweet succulent nests are found at Chickweed. I think they would look perfect on my patio table. Now I'll be heading back into the studio to check on my glue project (better be dry!) and do some more painting. 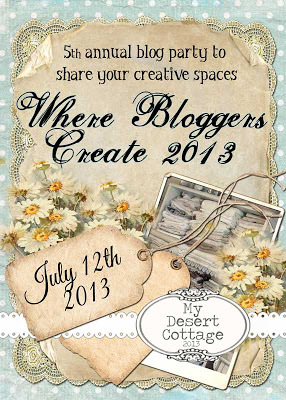 Which reminds me that the Where Bloggers Create 2013 party hosted by Karen at My Desert Cottage starts today. You'll find a list of all the participating blogs on Karen's sidebar. I'll also be pinning many of my favorites to my Where Bloggers Create Pinterest Board. You'll find gorgeous creative spaces and hundreds of fantastic ideas for your own creative place. 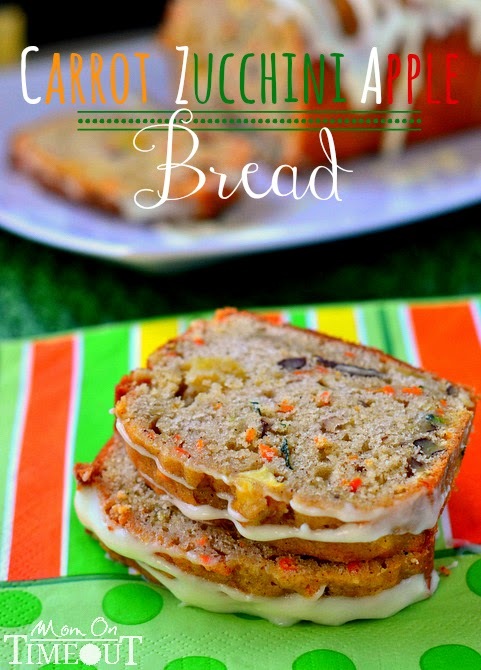 It's my favorite blog party ever! Thanks so much for stopping by today for my Friday Finds. Thank you so much for the feature Ms Laurel! 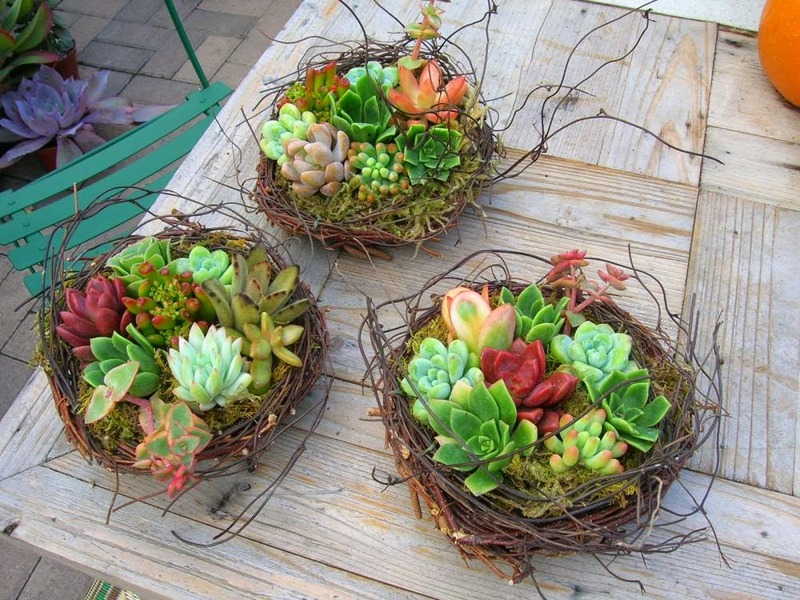 I'm loving the succulent nests...what a clever plant idea! Looks like I have a bunch of new blogs to check out! I love that cozy first picture! Enjoy your weekend! Hmmm.. thanks for the blogs to go peek at Laurel. Nothing wrong with a lazy week, We all need them every once in awhile. I'm setting aside all day Sunday to do my WBC hopping ~ I can't wait! I'm already regreting not 'playing along' this year ~ I'll definitely be joining up again next year!! 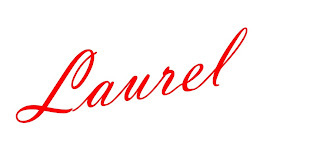 Oh laurel, such pretty inspiration! I see some new blogs I need to go check out! Very nice finds - so much inspiration out there! I'm also looking forward to seeing whatever it is you've been gluing! Love that first photo. The coffee table is beautiful!! Lovely ideas Laurel! Thanks for sharing such great ideas! I am in love with those adorable succulent nests! And the chicken coop turned coffee table is awesome!! All of these features are wonderful! I love the rustic garden corner.